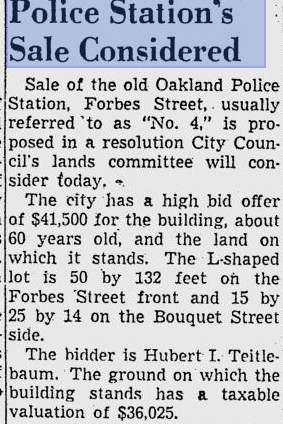 So we left off yesterday in 1952 with the building being considered for sale. It would eventually get sold for something more fun than a police station. This would be the start of things looking up after some of the tragedy this building has seen and hopefully the start of a turned corner for what appeared to be a lousy team of folks that ran the station. 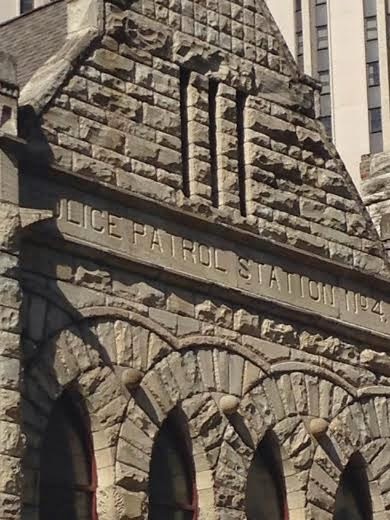 We are left knowing that the building was roughly 60 years old, leaving the building to have been built in the 1890s. This listing for a 1940 Hudson is from 1952 and Schenley Auto. The address is the building that was once a house on the corner of Forbes and Bouquet. This plot of land is now a grassy park area. We know that the former Schenley Auto had some operations in that spot. Below we see that there was a jeweler, Binstock Jewelry, located in the spot that is now "Noodles." Apparently they were also an authorized Toro dealer. One stop shop, pick up your wedding rings, some earrings and a new snow thrower. This was from 1964. That snow thrower in inflation dollars would be $681.00. Considering that today's state of the art snowblowers market for that much or more these days, that is about right. 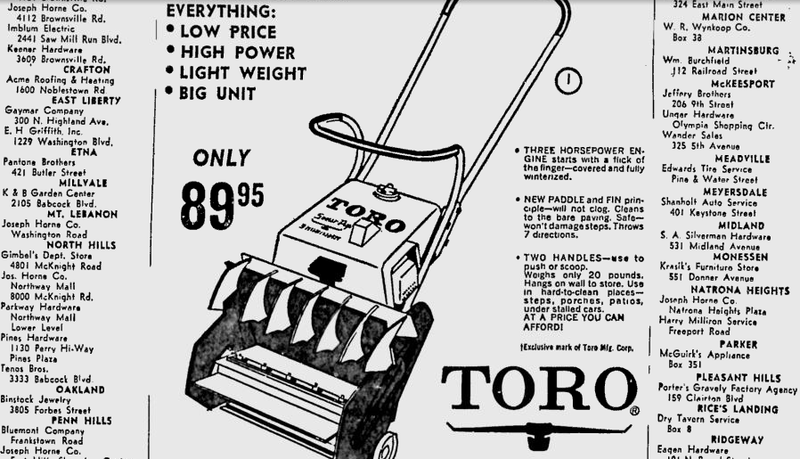 The basic Toro unit is still pretty much the same and runs in the 300 dollar range, making it about 40 bucks in those days. Anyways, Binstock was an Oakland fixture in jewelry for over 30 years. His Obituary has him passing away in 1986 at Oakland's Montefiore Hospital. I am not sure where he operated a store through all of those years because this address housed different things later on. We will flash back to the modern day photo of the building. 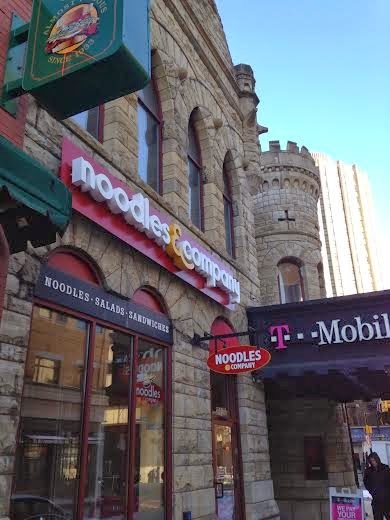 The Noodles Storefront is where the jeweler was located. The black awning is where the entrance was located for the theater we will talk about next. In a victory for preservation, a lesson that we should take to heart when it comes to these old buildings in regards to creative re-use. Also a victory for the community, this historically bad police station, fire department, and jail would turn into a first run movie theater. Oakland could use a movie theater and other types of healthy socialization places. I know this is the age of movie megaplexes, but I prefer going to the little Manor Theater in Squirrel Hill with leather reclining seats, a bar, and cheaper tickets, to spending my money at a drab, big box, and sanitized place like the Waterfront and other megaplexes. Anyways, you can see the movie opened at the same time as the Julie Andrews classic "The Sound of Music," a movie you will probably see on repeat at some point during this Easter season. The way they describe the decorations make this place seem like it was pretty neat. Nothing beats the character of an old movie house. You can see the classic "White Tower" burger joint that is now that little grassy park. 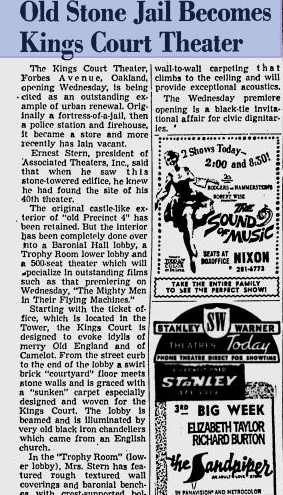 White Tower was based out of Milwaukee and considered to be a knockoff of White Castle, which was proven in a court case. This photo is from 1972. You can also see Presbyterian Hospital peeking out of the top right corner. In between White Tower and the theater you can see another bastion of the old days, a Kodak store. I wonder if I would be as into photography if I had to pay a ton for film. The loss of film put a lot of people out of work though. Trade-offs I guess. and the hints that this was a movie theater including the awning and the addition off of the back. This was a jail, police and fire station that could not respond to emergencies in an expedited manor due to the traffic from the nearby Forbes Field baseball park and the University of Pittsburgh. It goes from that to a movie theater. I call that a victory. I would not mind if it switched back to a theater. We learn that in the 80s the jeweler became a TCBY. I remember those. Expensive frozen yogurt but it was good. The chain became a victim of the weak economy in the early 2000s. The next article is something that I find to be completely ridiculous. I always say that if you do not like something, do not watch it and go on your way. 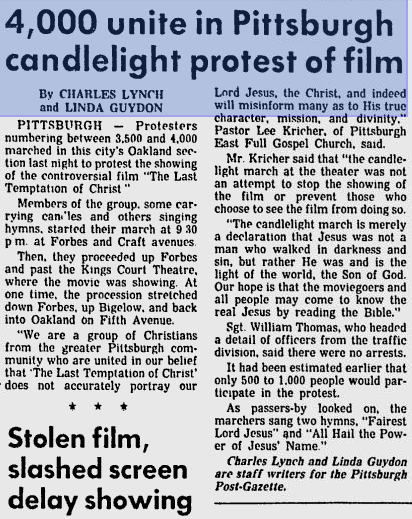 4,000 protestors? A slashed screen? A stolen film reel? Really? Grow up for starters. If you do not like something do not do it or watch it. Simple stuff that should be easy to comprehend. This story is from 1988. 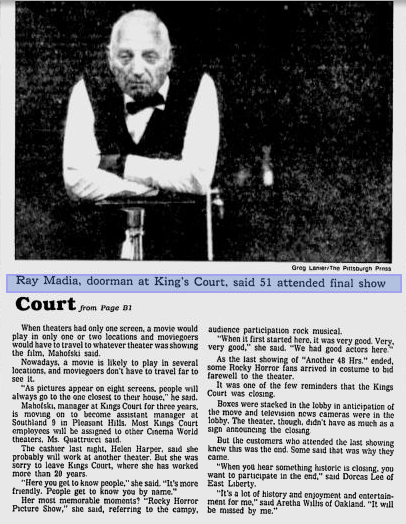 The theater would eventually go out of business in 1990. 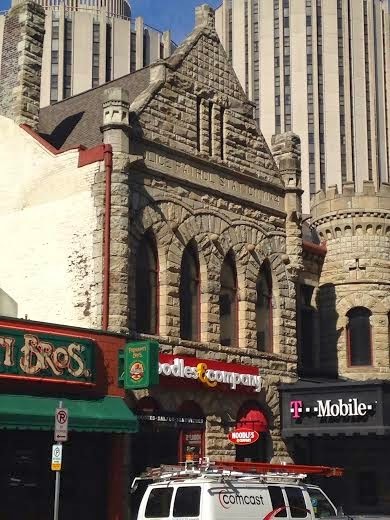 Here you can see the way the Kings Court Theater sign looked along with the neighboring TCBY Frozen Yogurt. 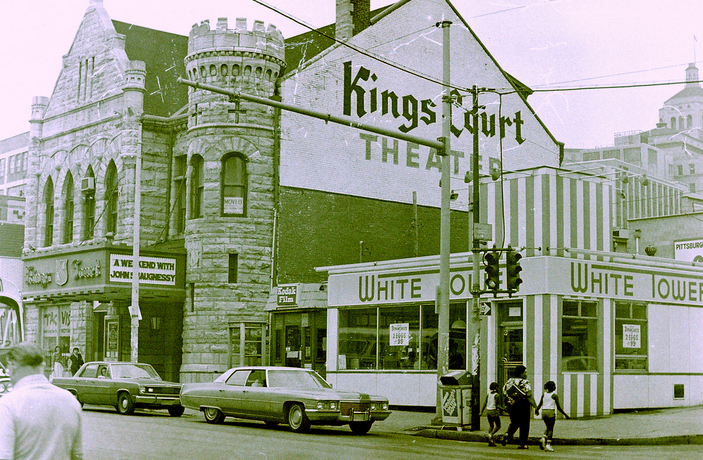 The theater was known for having the classic "Rocky Horror Picture Show" cult showings. Given the location in a college neighborhood I can see how it would have taken off at this theater. The fun was not over for this building quite yet. An eclectic place called "The Beehive" opened up in the building in the early 90s. 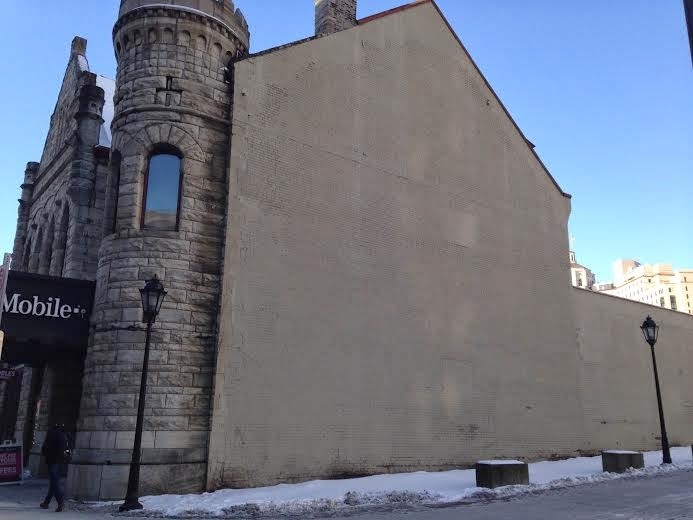 This was said to be Pittsburgh's first coffeehouse. 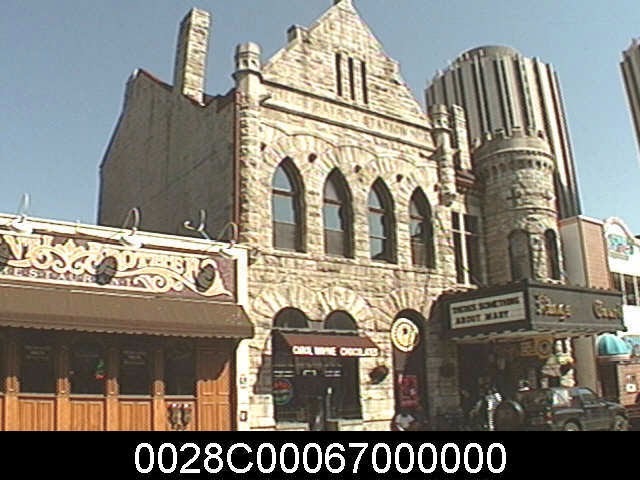 They had a second location in the South Side which still exists today. I highly recommend checking out that coffeehouse for they have great coffee, desserts, and a wonderful social setting. I wish they still had an Oakland location. The place held many artistic events as you can see throughout these next few clippings. 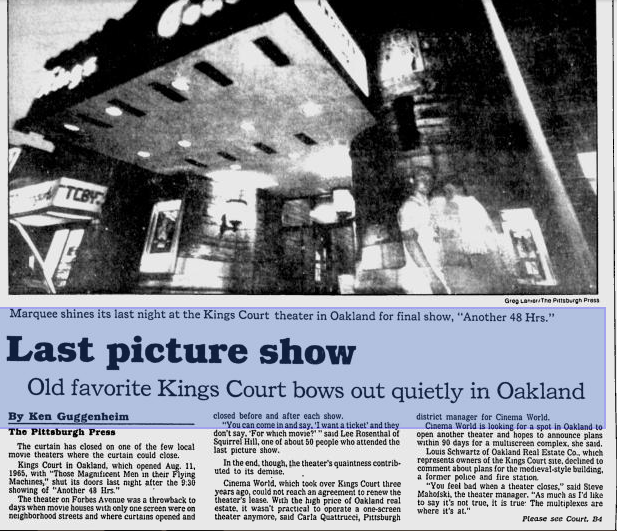 In the first clipping you can see that Oakland seemed to be a more fun place back then. The following shows a video from 1992 of a very grunge type, Nirvana-ish type group. Very representative of the area. Oakland once had a thriving live music scene. Now there is pretty much nothing which is pretty depressing. I am not sure exactly of what is going on in the video but it looks like the folks are having a good time. Thank goodness for those skyrocketing rents though! What community needs places where folks can socialize when you can put in a T-Mobile and the hipster capital store American Apparel. 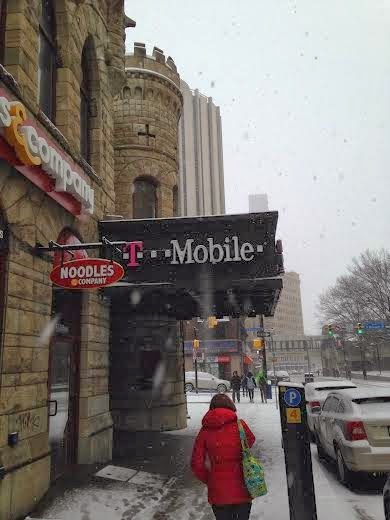 The latter closed and stayed vacant for a few years until it was replaced by the Noodles Restaurant. 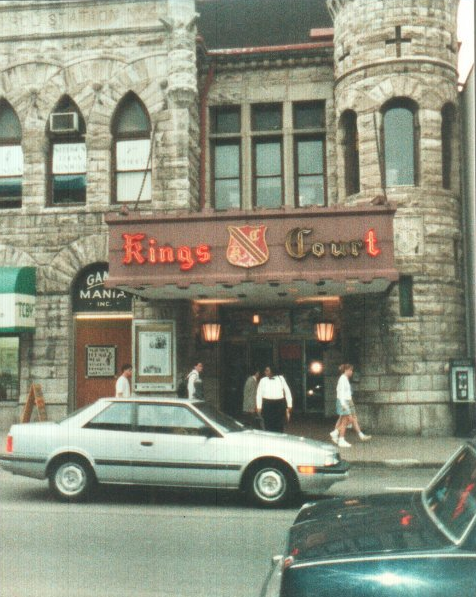 This restaurant is popular and serves decent food, but we lost several irreplaceable places like the coffee house and movie theater. The are places where folks can have clean fun, socialize, and bind as a community. Oakland is not necessarily falling apart by any means, but we can look at communities that are falling apart and see that the places where folks went to have good and clean fun are long gone. Those places are where folks bond socially as a community. 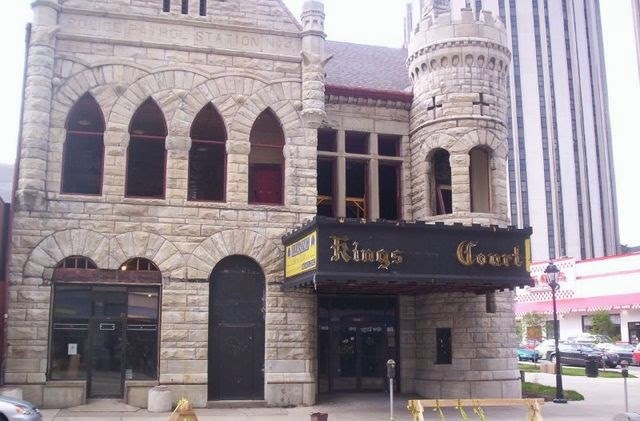 We cannot keep losing places like movie theaters, drive ins, coffeehouses, roller rinks, amusement parks, and other places where folks can go and have good and clean fun for they are the glue that keeps communities together. Now we time travel back to the yawn inducing present after seeing the eclectic past that this pretty much forgotten building had. My final message is to preserve the landmarks that we have, the buildings that make our communities what they are and how we can better utilize them for the betterment of everyone.